If you haven’t already played around with Google Goggles, you’re really missing out on an amazing use of technology. The free application for your Android or iOS device allows you to retrieve various bits of information related to something by simply taking a picture of it. You can use the app to find out about anything from books to toys to even that addictive pack of gum in your pocket--and don’t forget about landmarks, in the spirit of the summer season. The Google Goggles team expanded its database by teaming up with the J. Paul Getty Museum in Los Angeles, California. Now, patrons of the Getty will able to retrieve a wide plethora of information related to its paintings collection by snapping pictures of them. 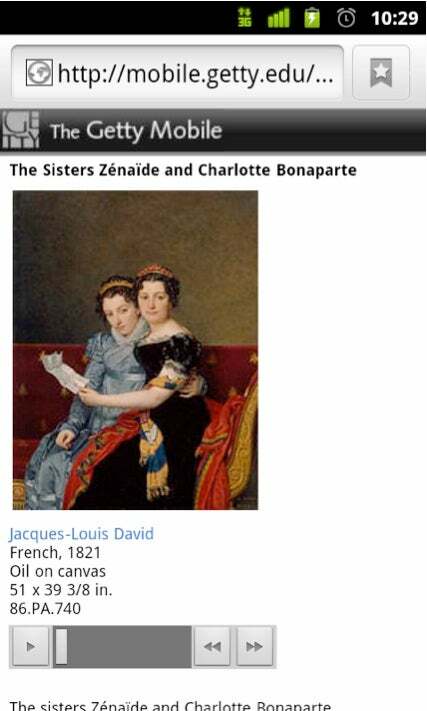 After taking a picture of a painting, the app takes users to the Getty’s mobile-optimized website. There, users will be able to not only read extra information that just can’t fit next to the painting, but they’ll also be able to listen audio commentary from artists, curators and even the painting itself. Enabling the search history on your android phone will allow you to record your entire experience or simply allow to you zip through the collection to return to later if there’s a crowd that doesn’t seem to dissipate. You can also use the app to get some quick information to check whether an annoying know-it-all is full of it or not. All in all it’s a really great idea. So, if you’re in the traveling mood and find yourself at the Getty, give the app a try and tell us how it goes! David Saetang is a lover of the arts and an even bigger lover of technology.